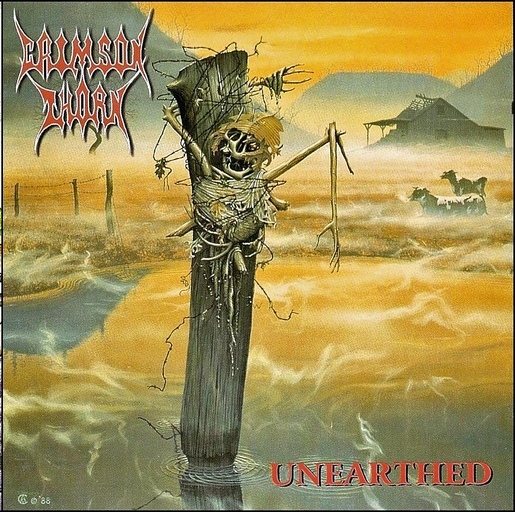 If there would be a contest like "the most brutal Christian metal band", Crimston Thorn would immidiately win that by "Unearthed". Christian death metal isn't a common thing to find, but fortunately (or unfortunately?) some bands found their way of self-expression in this exaggerated paradox. Of course Chrimson Thorn don't had it's influences from gospel music, but from the less Christian main scene instead. Early Suffocation and Obituary could be mentioned after their very harsh sound, vocal style, intense hammerings and common mid speed themes. Musically "Unearthed" isn't so complex, but not so groovy either, stays on the middle way. It's a great mix that shows the brutal taste of both sides and could be enjoyable without turning to sound too monotone. The lyrics are compromise-less and similar exaggerated as the music, so the aggressive aspect of the religious concept should be expected. Heavier in all-round than their comrade band Mortification was, but their name is maybe less known. That's partly because cause it's hard to imagine that religious people would listen to Christian death metal, and the concept may be divisive for the ordinaty death metal audience. However, it's an interesting classic!